The Chautauqua Global Growth Fund invests primarily in equity securities of both U.S. and non-U.S. companies with medium to large market capitalizations (i.e., those with market capitalizations in excess of U.S. $5 billion at the time of purchase). Equity securities in which the Fund may invest include common stocks, preferred stocks, depository shares and receipts, rights, warrants and exchange-traded funds (ETFs). Under normal market conditions, the Fund will invest at least 40% of its total assets at the time of purchase in non-U.S. companies. The Fund will normally be diversified among at least three different countries, including the United States. The Fund invests primarily in developed markets but may invest in emerging and less developed markets. In evaluating potential investments, the advisor considers companies with growth characteristics that the advisor believes are likely to benefit from current macroeconomic and global trends and to possess sustainable competitive advantages. The Fund will normally hold a concentrated number (generally 35 to 45) of companies. A redemption Fee of 2.00% is assessed on shares held for 90 days or fewer, as a percentage of the amount redeemed. The Net expense ratio is the Gross expense ratio minus any reimbursement from the Advisor. Effective December 1, 2018, the expense cap/reimbursement agreement between the Advisor and the Fund was amended and restated. Effective December 1, 2018, the Advisor has contractually agreed to waive its fees and/or reimburse expenses at least through April 30, 2020, to the extent necessary to ensure that the total operating expenses do not exceed 1.05% of the Investor Class's average daily net assets and 0.80% of the Institutional Class's average daily net assets. Investor class expense ratios include a 0.25% 12b-1 fee. Performance data quoted represents past performance. Past performance does not guarantee future results. Investment return and principal value of an investment in the fund will fluctuate so that an investor's shares, when redeemed, may be worth more or less than their original cost. The funds' current performance may be lower or higher than the performance data quoted. A redemption Fee of 2.00% is assessed on shares held for 90 days or fewer, as a percentage of the amount redeemed. Performance data does not reflect this redemption fee. Effective December 1, 2018, the investment advisory fee that the Fund pays to the Advisor was reduced from an annual rate of 0.80% of the average daily net assets to an annual rate of 0.75% of the average daily net assets. The gross expense ratio is as of 12/31/2017 and was adjusted to reflect current fees. Effective December 1, 2018, the expense cap/reimbursement agreement between the Advisor and the Fund was amended and restated. The net expense ratio is the gross expense ratio minus any reimbursement from the Advisor. Effective December 1, 2018, the Advisor has contractually agreed to waive its fees and/or reimburse expenses at least through April 30, 2020, to the extent necessary to ensure that the total operating expenses do not exceed 1.05% of the Investor Class's average daily net assets and 0.80% of the Institutional Class's average daily net assets. Investor class expense ratios include a 0.25% 12b-1 fee. The Fund may hold fewer securities than other diversified funds, which increases the risk and volatility because each investment has a greater effect on the overall performance. Foreign investments involve additional risks such as currency rate fluctuations and the potential for political and economic instability, and different and sometimes less strict financial reporting standards and regulations. The MSCI ACWI Index® is a free float-adjusted market capitalization weighted index that is designed to measure the equity performance of developed and emerging markets. The MSCI ACWI Index® consists of 44 country indices, including the United States, comprising 23 developed and 21 emerging market country indices. Brian formed Chautauqua Capital Management in January 2009. Prior to this, he was a member of the TCW Concentrated Core Equities portfolio management team from 1998, which was responsible for the management of up to $27 billion in assets. In 1999, he was named Director of Equity Research. In 2003, he became a Senior Equity Strategist. 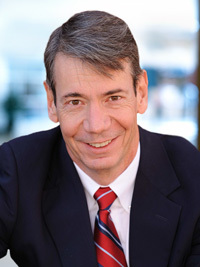 In 2005, Brian began managing International and Global Equity portfolios. Prior to working at Trust Company of the West, he worked with Scudder, Stevens & Clark; Bear, Stearns & Co.; and Security Pacific Bank in roles including portfolio management, research and trading. He earned a bachelor's degree in public administration and an M.B.A. from the University of Southern California, Los Angeles. He holds a certificate for global investing from INSEAD. He received his CFA charter in 1989.